A plethora of holiday events and seasonal entertainment make the winter one of Long Island's most cherished seasons! 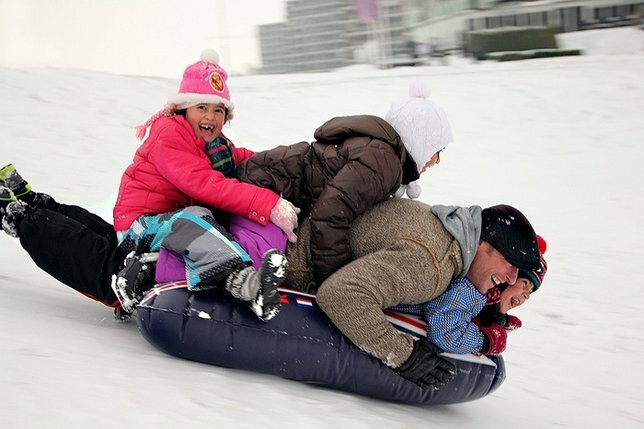 Sledding is perfect fun for the entire family! The leaves have all fallen, a chill has entered the air, and the first snow of the season has left a dusting across local towns. Needless to say, winter has finally arrived here on Long Island! The end of 2017 and first few months of 2018 is not a time for hunkering down, as the season is an exciting period where indoor and outdoor entertainment combine to create a magical time for local families. Enjoying Long Island once is turns into a Winter Wonderland is as simple as choosing one of the endless number of activities that our home as to offer. From ice skating to holiday lighting ceremonies and light shows, there will always be something going on in a town near you. Plus, for those nights when it's best to stay warm by the fire, there are winter films, crafting projects, and family games to stay busy with. It goes without saying that there are adventures waiting to be had for all Long Islanders, regardless of age or personal interests! Here's our Winter 2017-18 Bucket List to help you add a few things you might have missed on your own list! The 14th Annual Girl Scouts of Suffolk County's Holiday Light Show has to be seen to be believed! Long Island's Christmas tree farms and stands have gorgeous trees ready to be picked out! Hanukkah's eight day will be celebrated with a number of Menorah lighting ceremonies! Bask in the spirit of the holidays at a Christmas tree lighting ceremony! Enjoy a delicious Santa Brunch with the family and take some cherished holiday photos! Utilize the unique landmarks across Nassau and Suffolk for holiday photo shoots! Support a local charity this holiday season through volunteering or donations! Ring in the New Year with a fantastic nightlife celebration at a renowned LI venue! Enjoy the magic of live entertainment with a holiday show put on by a local theatre group! Acquire the perfect handmade holiday gifts at a local craft fair! The Elf on the Shelf can become a hilarious staple of your holiday decorations with a bit of creativity! Create the perfect gingerbread house for decorating your home or giving as a gift! Three full months of winter may seem like a long time, but with the activities to fit in before spring arrives, it's going to be quite the packed season! Whether you're looking to stay warm inside or enjoy the great outdoors, there is plenty to see and do! Roll some strikes and spares at a local bowling alley! Learn something new at one of the 100+ museums that LI has to offer! Nothing could be better than a piping hot cup of homemade hot chocolate on a chilly night! Local and exotic fishes will be on full display all winter long at aquariums! Keep the kids entertained on a snowed-in day with these crafting activities! Celebrate National Hobby Month this January by enjoying a new activity! Gather friends and family members for a night of board games around the fireplace! Grab a cup of hot chocolate and your favorite blanket to enjoy a winter film favorite! Feel the rush of adrenaline by sledding down one of LI's best hills! Prepare for battle with a rousing backyard snowball fight! Ice skating is the perfect way to enjoy the winter atmosphere with the family or your special someone! Bundle up during the next snowstorm and head out to build a snowman, igloo, or snow fort! Help out a neighbor by shoveling his/her walkway and driveway after a snowstorm! Holidays and Special Events: MLK Day, Valentine's Day, St. Patrick's Day, and More! Christmas, Hanukkah, and New Year's may start off the winter strong, but there are a number of exciting holidays and events in the first few months of 2018 to look forward to! Cheer on your favorite team with some beer and wings at one of LI's best brew pubs! Enjoy some lip-smacking appetizers during the big game with these easy recipes! Observe Martin Luther King, Jr.'s birthday by helping out in your local community! Learn all about the important African Americans that have called Long Island home! Find out what Valentine's Day truly means, and get some tips for celebrating it in style! Ensure that you show Mom how much you care with these thoughtful gift ideas! Surprise the love of your life with one of these romantic gifts! Preserve your lucky four-leaf clover and enjoy the good fortune throughout the year! Learn all about the history behind the symbols and traditions of the cherished holiday! Whip up one of these delicious Irish dishes for your St. Patrick's Day meal! What does your Winter 2017-18 Bucket List look like? Let us know in the comments below! LongIsland.com’s 2017 New Year’s Entertainment Guide: Celebrate With Fantastic Local Events! Suozzi Congratulates Local Students on Winning National Science Competition in Washington, D.C.
Subject: LongIsland.com - Your Name sent you Article details of "Winter Bucket List 2017-18: Stay Warm With Exciting Local Activities"